Humoral immunity plays a larger role in ridding the body of intercellular infections, such as those caused by bacteria. The previous sections have introduced the various parts of the immune system and their reactions, but it is helpful to rethink their functions in the context of a complete response to an invading pathogen. In this section, we will examine how the immune system as a whole recognizes and repels an invader and in the process give you a better look at the forest of host defense and not just the trees. Figure 15.26. Immune response to bacterial infection with S. pyogenes. Examples of the range of immune defenses against a bacterial pathogen include antibodies and phagocytes that capture and kill the invading microbe. Most of the destruction occurs in the extracellular fluid. Infection by S. pyogenes typically begins in the mouth and upper respiratory tract. In this example imagine that a group of 10,000 or so S. pyogenes organisms enter the mouth from a droplet of mucus picked up from a nearby child ill with strep throat. Many of them are destroyed by the stomach juices when swallowed and still others are digested by lysozyme in saliva that degrades their outer peptidoglycan layer. The microbes that are left attempt to attach to the surface of the throat using lipoteichoic acid present in their cell walls, but the normal flora occupy most sites for attachment. Many are also repelled by secretory IgA antibody in saliva that cross-reacts with antigens on their surface. However, a few are successful in gaining a loose attachment in the throat and they then bind more tightly with the help of M protein on the microbe and fibronectin present on the epithelial cell surface. Once bound, the microbes begin to multiply and increase in number. Multiplication is hampered by the low pH created by the normal flora and the presence of β-lysins. Lysozyme is also constantly chewing at the cell walls of attached bacteria, but the presence of the capsule protects them from some of these attacks. The colony begins to expand and invade layers below the epithelial cells. The host's surface defenses have failed to repel the infection. S. pyogenes begins secreting a damaging cocktail of enzymes into the surrounding host tissue. Hyaluronidase degrades hyaluronic acid, a compound that cements cells together in many mammalian systems, allowing further invasion. Secretion of DNase, RNAse and proteases also aid the microbe. This internal invasion causes the secretion of bradykinin and other chemokines from damaged cells, thus initiating the process of inflammation. Bradykinin binds to receptors on blood vessel cells in nearby capillaries causing them to create gaps in the blood vessel walls. Microbial products and the chemokines from damaged cells leak into the surrounding area and into the bloodstream, attracting the attention of phagocytes (mostly neutrophils, but also macrophages) and they begin to migrate to the area and attack the invading S. pyogenes. At this point phagocytic attack is inefficient, because the bacterium secretes several proteinsâ€”leukocidins--that are toxic to phagocytes. S. pyogenes is also surrounded by a capsule made of hyaluronic acid â€“ yes, the same compound cementing our cells - and this disguise makes the microbes difficult to recognize. Interestingly, this capsule is also attacked by hyaluronidase made by the pathogen, but they seem to make enough of it that it is still protective. The capsule also makes phagocytosis difficult. Despite the resistance of S. pyogenes, a significant number are phagocytized and killed by neutrophils and macrophages. However, due to the slow rate of phagocytosis, the number of bacteria continues to increase. The body attempts to wall off the infection by encasing it in a fibrin clot, but streptokinase produced by the microbe dissolves the clot, further advancing the infection. As the number of microbes increases, greater numbers of neutrophils, macrophages and dendritic cells penetrate the area. Active phagocytosis causes the release of more mediators of inflammation and the inflammatory response intensifies. This now becomes noticeable as soreness at the back of the throat. As neutrophils fill with bacteria, they die and make up the pus that runs down the back of the throat and causes the characteristic yellow spots of strep throat. Bacteria taken up and destroyed by macrophages and dendritic cells are processed and protein fragments, coupled with MHC II molecules are displayed on the cell membrane. During this processing, the macrophages and dendritic cells move toward a nearby lymph node. Inside the lymph node, processed antigens lying in the cleft of the MHC II molecule are presented to a series of T helper cells. Eventually, a successful interaction between the TCR of a TH2 cell and the antigen-presenting cell causes the release of IL-1 and IL-6 from the macrophage. One result of the increased levels of IL-1 is its interaction with the hypothalamus in the brain, which then increases the temperature of the body. The characteristic fever of strep throat increases the activity of T cells. IL-1 and IL-6 stimulate the T cells to proliferate. Proliferating T cells produce IL-2 and IL-4-6 and these further induce T cell multiplication. Most of the TH2 cells help B cells produce antibody, but some remain as memory cells and circulate through the blood and lymph systems. Receptors on B cells begin to encounter antigens that are flowing from the infected area into the lymph node and these reactions also cause them to proliferate. Some of the antigen that binds to the B cell ends up in MHC II molecules on the surface of the B cell and is presented to T cells residing in the lymph nodes. A previously activated TH2 cell recognizes this antigen in the MHC II molecule and secretes IL-1, IL-4 and IL-5 that stimulate B cells to multiply. As the number of B cells increases, TH2 cells start secreting IL-2, IL-4 and IL-6 that signal to the B cells to differentiate into plasma cells. Plasma cells mobilize large numbers of structures needed for the production and secretion of antibodies (e.g., ribosomes, endoplasmic reticulum, Golgi apparatus etc.). Mature plasma cells migrate to the center of the lymph node and begin secreting IgM antibody specific to the antigen. The rate of secretion can exceed 10 million antibody molecules per minute from an active plasma cell. A fraction of the B cells do not differentiate, but remain as B memory cells. These memory cells disseminate throughout the body in lymphoid tissues and serve as sentries waiting for the next invasion by S. pyogenes. The full process of antibody induction takes around 7 to 14 days. Initially IgM is made, but this shifts to IgG later in infection. Antibody now exits by the efferent duct, travels through the lymph system and enters into the bloodstream. It circulates in the body and eventually comes in contact with S. pyogenes in the throat. 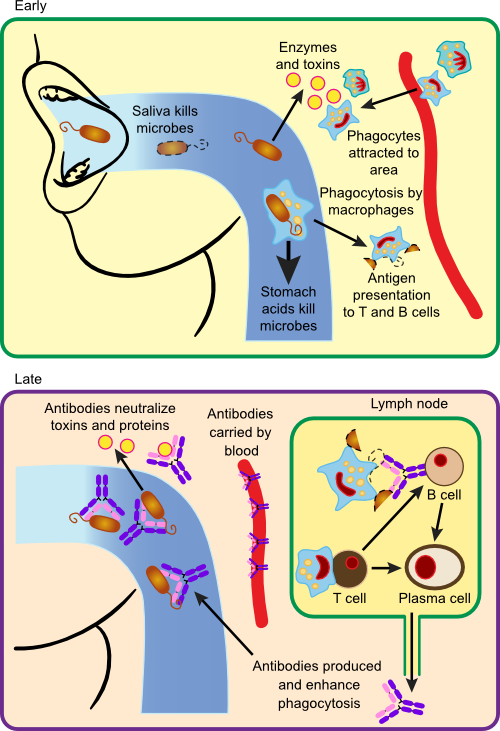 The entrance of antibody into the sites of infection turns the tide in favor of the host. A large assortment of antibodies is made to many different antigens present on the microorganism. Antibodies directed against the toxins of the microorganism react with and neutralize them. Antibodies against cell surface antigens stick to the microbe and attempt to induce the complement cascade. In the case of S. pyogenes, this reaction is not very effective due to the thick capsule surrounding the microbe. However, antibodies directed against the M protein are extremely effective opsonins. Phagocytes can now rapidly engulf and phagocytize S. pyogenes. Entrance into the phagocyte is rapidly lethal for S. pyogenes, because the microbe does not produce catalase or significant levels of superoxide dismutase and is ill-equipped to deal with the oxygen radicals produced in the phagolysosome. Minutes after being engulfed by a phagocyte, the cells are dead. The end result of antibody production is a rapid clearing of pathogens in the area of infection. Microbial numbers begin to decrease rapidly and within a few days, the infection and its symptoms dissipate. In reality, this course of events does not happen in a patient with strep throat. Individuals who are infected with S. pyogenes are given penicillin, to which the microbe has never become resistant. This is fortunate because some of the antigens present on S. pyogenes are similar to self-antigens on the heart and kidney. In about 1-3% of cases, the development of an immune response against S. pyogenes can lead to rheumatic fever, an autoimmune disease where antibodies directed against the M protein of S. pyogenes attack the heart muscle. To prevent this serious and undesirable immune reaction, S. pyogenes infections are treated with antibiotics before the body has a chance to mount a vigorous immune response.